Before Drake owned mansions in Toronto and L.A., a young Aubrey Graham wrote notes to his mother promising to clean his room ... and now you can buy pieces of his childhood for several thousand bucks. A page ripped out of Drizzy's old lyrics notebook is going up for sale through the memorabilia company, Moments in Time -- and they're hawking Drake's handwritten note to his mom, and an early bio he wrote for himself, for $7,500. 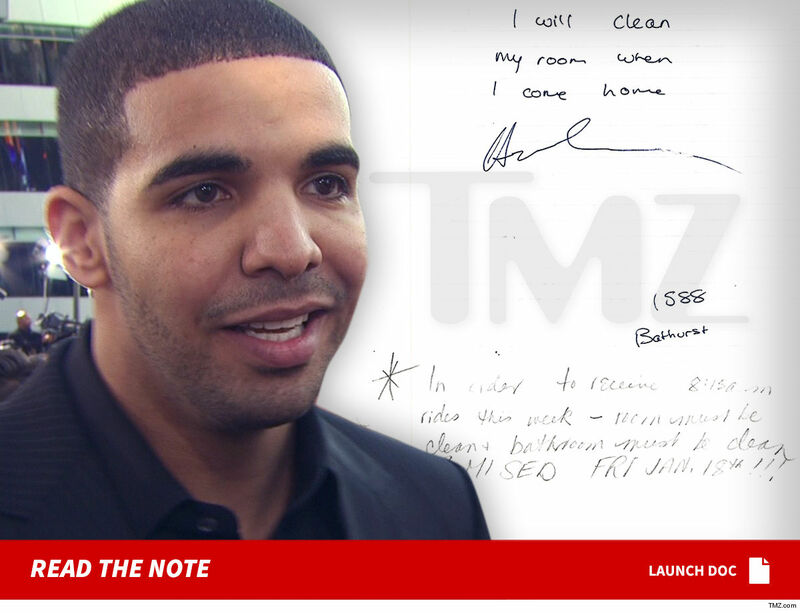 The note to his mom is super cute ... Drake promises to clean his room when he comes home, and someone wrote back, "In order to receive 8:15 am rides this week -- room must be clean + bathroom must be clean AS PROMISED FRI JAN. 18th!!!" Maybe that's why Drake famously rapped, "livin' at my momma's house, we'd argue every month." On the back of the note is a bio Drake created on his own ... and it sheds some light into how a young Champagne Papi dreamed of making it big. He lists his music influences, hobbies and talents -- with a special shout-out to his pops. The extremely personal page is from Drake's old rhyme book, which was found in a dumpster near his grandpa's old furniture factory in Toronto, where Drizzy used to work. Check it out ... and see how far Drake's come from his days living at his mom's house.